I can't quite logically explain why I've continued to watch the US version of Wilfred. The stories are quirky and at times nonsensical. The primary premise involves a guy walking around in a dog costume being, well, a dog. It's a very, very strange show with unusual plot twists and a lot of recreational drug use. But I have kept up with the show over the seasons and it still has me willing to watch the next episode time and again and I don't perfectly know why. I suppose a large part of things is just wanting to understand why Ryan can see Wilfred at all. It's the central premise behind the show and naturally it's the one question that they can't really until the very end. Or maybe I just get a kick out of humans behaving like dogs. Or maybe I'm under some hypnotic spell cast by Elijah Wood's amazingly blue eyes. 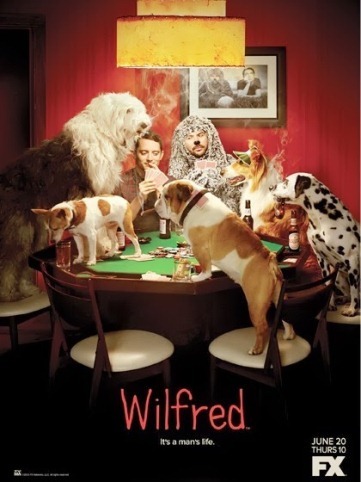 Synopsis: Wilfred is the US adaptation of the Australian TV series of the same name. The show was created by Jason Gann and Adam Zwar and Gann continues to star in the US version of the series as well. The second season ended with the strange discover of a childhood drawing featuring a young Ryan (Elijah Wood) and what appears to be Wilfred (Jason Gann) hiding behind a tree. And while originally Wilfred claimed to have created the drawing himself, Ryan discovers more evidence to indicate that the drawing was something he made as a child. So does this mean that Wilfred is more than just Jenna's (Fiona Gubelmann) dog? How else could he have been there when Ryan was just a kid? This third season sort of dances around this mystery and keeps dropping different hints along with a number of red herrings as we puzzle over things. But this is not the core mystery that advances with every episode - we just get what we can when it comes, really. And the rest of the time there's just more of the weird antics that Wilfred and Ryan get into as most unusual best buddies of sorts. And initially they have a lot more time together since Jenna and Drew (Chris Klein) finally got married last season and have been away on their honeymoon around the time the season picks up the story. And so we have a lot of different stories like Wilfred's disappointment that Ryan was making friends with the mailman or even Wilfred finding love of a sort and trying to follow his heart despite things being stacked against him. And of course there's that episode with Bruce playing one of the most complex games of all. This season brings in the even more unusual concept of some sort of a "dog god" that may or may not be Wilfred. Isn't he just supposed to be Jenna's dog? But how did he get in Ryan's childhood drawing? Wouldn't making him a deity explain things? But is he a good god or a bad one? Or is he just a guy in a dog suit after all? Far too many questions! Wilfred is a quirky show but admittedly it's not a great one. It has its moments of interest and its moments of humor but on the whole it's just strange - and yet I seem to like it. This third season didn't quite help make things any clearer and it gets 3.5 Wilfred moments with Bear out of a possible 5.